Diana frequently sought companionship from women friends, and was portrayed artists as bathing alone or in the company of courtly nymphs who shared her way of life. But Diana, tall and enchantingly beautiful, attracted male onlookers who would regret violating her privacy. She was fiercely protective of her personal space and freedom. The association between Diana and the wilderness - symbolic of her untamed spirit, and her need to protect her own sanctity and that of others, meant that she was threatening to men, whether she intended to be or not. Those who attempted to curtail her freedom or to invade her privacy were recipients of her wrath, which sometimes unleashed circumstances that led to their own destruction. 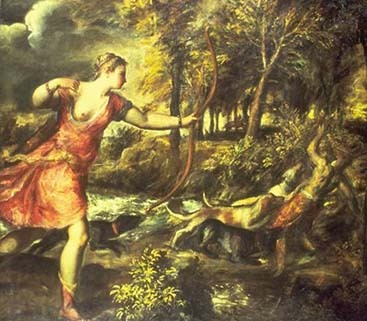 When the hunter Actaeon intruded on her privacy, she shot her arrows at him, then turned him into a stag. Now he, the hunter, became the hunted as his own dogs turned upon him and tore him to pieces. her aims, or invaded her privacy were often recipients of her anger. sky, she illuminated the earth with her rays of light. Internet trainer, and developer of Windweaver Web Resources.